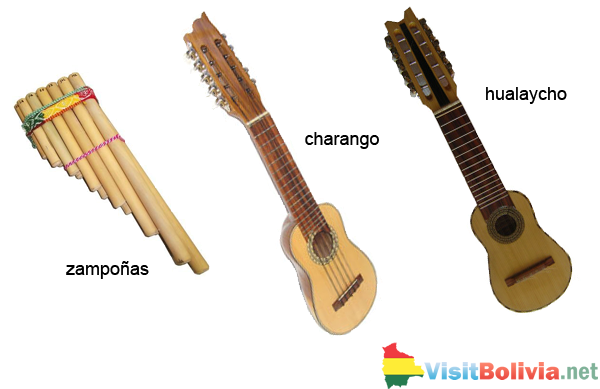 To know more about the kinds of music in Bolivia is to know more about the regions that make up the country. Bolivian music is as rich, dynamic and as varied as its multi-ethnic populace. Aside from the foreign and international influences with Spanish notes being the most resonant, each of the over 30 ethnic groups in the country has its own style of indigenous music and accompanying instruments. Throughout Bolivia, the music is typically lively and very festive. There is the tango (which is also a traditional dance), opera and generally based on native folklore. In the Andean regions, music can range from the very high-spirited to the melancholy and often centers on telling a story such as the legends of the Aymara, Quechua or the Tiahuanacota people or messages of hope, love and protecting nature. Each music style in the Andes also has its own accompanying particular dance style – there is the caporal, cueca, or cumbia in Western Bolivia for instance. As well, they use different types of instruments such as the zampoñas (pan pipes), charango (a tiny 12-string guitar traditionally made of armadillo shell), hualaycho (a small, lute-like fretted stringed instrument) or the quena (traditional Andean flute made of bamboo). On the other hand, the east of Bolivia boasts of merry music – there is the chacarera or the taquirari. Southern Bolivia has the liveliest type of music where it has been heavily influenced by the music of gauchos (cowboys) from Argentina. Other popular musical styles are classical guitars and orchestras made famous throughout the world by such individuals as Luis Alfredo Gavilano and the Andean music group, Kalamarka.